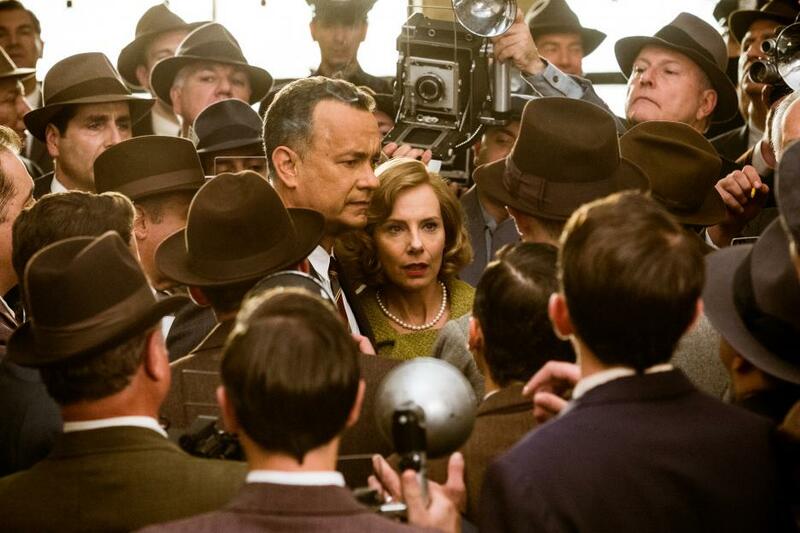 The year is 1957 when Steven Spielberg’s Cold War drama Bridge of Spies opens. America is fraught with us vs. them fever (them being the Soviet Union) and open panic, fear and anxiety are the norms of the day. For Spielberg, this is but another day at the office as Bridge of Spies fits like a tee in with other maturely themed prestige pictures he has unveiled in recent years (Lincoln, Munich). All of those films chronicle great men in dire times, all are period-set and steeped in a then vs. now mindset. One may be masterpiece (not Bridge of Spies). Grave, gray and more than a bit on the square side, Bridge of Spies stars Tom Hanks (who previously starred in Spielberg’s masterwork Saving Private Ryan and deathly misfire The Terminal) as the real-life James B. Donovan, an insurance lawyer turned cloak and dagger-like Cold War operative. As the plot comes in motion, Donovan is tasked with representing Rudolf Abel (Mark Rylance), a man of mysterious lineage assumed to have Soviet connections (as presented, he’s a shadowy figure lifted out of the Tinker Tailor Soldier Spy mold). The case is a guaranteed loss, and one that is rather jokingly written off even by the trial’s own judge. But the trial is brilliant public relations as Abel is granted due process and treated in honorable (read: American) fashion before possibly getting sent to the chair for his crimes. Yet Donovan sees things a little differently. He thinks Abel is worth more alive and in a pinch might make a viable trading opportunity should one of our men get lost and detained behind the Iron Curtain. As embodied by Hanks in his hearty, all-American boy scout demeanor, Donovan may be the only man of reason and sound logic in a time prone to hysteria and panic- Donovan’s young son even advises on proper “duck and cover” techniques which he learned at school. Donovan is the idealistic, yet also the pragmatist. So much so, that even when the press denigrates him a traitor for defending such a sort, Donovan still takes the time and patience to develop a rapport (perhaps even a friendship) with Abel, imbuing a sense of good old fashion American sensibility and sensitivity. Donovan’s tactic works as two young Americans become captured by Soviet forces- U-2 pilot Francis Gary Powers (Austin Stowell) and student Frederic L. Pryor (Will Rogers). Donovan, then must travel across the Berlin Wall and back to negotiate the exchange. 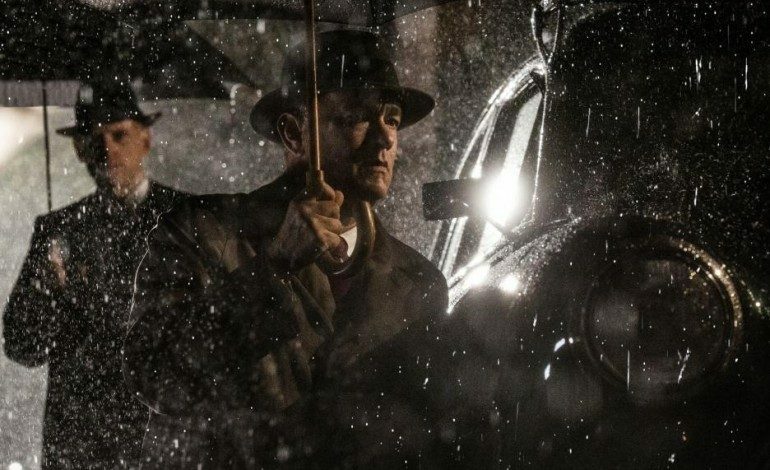 As such, Bridge of Spies is a tried and true, classically structured slow burn. So much that the immaculate polish of Spielberg’s filmmaking sometimes get lost in the predictable flow of its events. Cold War dramas, by nature, are procedural and rather elemental. Men from different sides meet under the cry of night in rooms, both lock eyes and try not to blink. The delicate dance is deathly serious but there’s fun to be had as the poker players try to call one another’s bluff. Yet, in Bridges of Spies, more often than not, there’s a coldness, a slight remove and only a tinge of tension (John le Carré not quite). Bridges of Spies straddles grand ideas and doesn’t strain too hard in trying to distinguish the similarities in global politics past and present, but there’s little life to the proceedings. The stakes couldn’t be higher, but there’s such a mundane, business-as-usual workman-like aesthetic here, Spielberg and Hanks might as well have been negotiating for tariff decreases on the price of milk. As such, it’s the details the mark the film somewhat special. The opening sequence is a whopper of suspense and a fine example of Spielberg’s classical movie influences- the opening number would surely have made his heroes Ford and Hitchcock proud. Abel sits and calmly paints in his New York hovel when the telephone rings. He’s summoned for a mission of sorts, but while out has attracted followers on to him. Nearly wordless and almost completely devoid of musical accompaniment, we study and observe as Abel roams about, travels by subway and extracts a code from a hollow nickel once he presumes he’s safely back at home. The expert precision, the feeling the movie is three steps ahead of us is intoxicating. As such, it’s something the movie never quite achieves again as the slow burn of civics lectures and Capra-esque sermonizing take over- the script was credited to Mark Charman with a re-write by Ethan and Joel Coen (this is infinitely superior than their last credited re-write- Angelina Jolie’s Unbroken at any rate). There’s smaller moments of impact- the charging down of a U-2 plane, a bike ride alongside the Berlin Wall while it’s being constructed- but there’s a stagnant “sameness” that seems to permeate throughout Bridge of Spies; the films’ snail-like pace doesn’t help. Rylance’s performance, though, is a marvel of quietly coiled precision and fascinating in the way the actor is able to express a wide range of idiosyncratic ticks while remaining absolutely still; I also admired that Donovan was given a cold during his trip to Berlin, notching up the stress factor. The drama, however, is all just a bit under-cooked and overly processed. What’s left is to sit and admire Spielberg’s pristine mise-en-scéne, the beautifully washed out photography and the way the great director masters the textured geography of his scenes. Spielberg can be accused of many things, but bad filmmaking is not one of them. 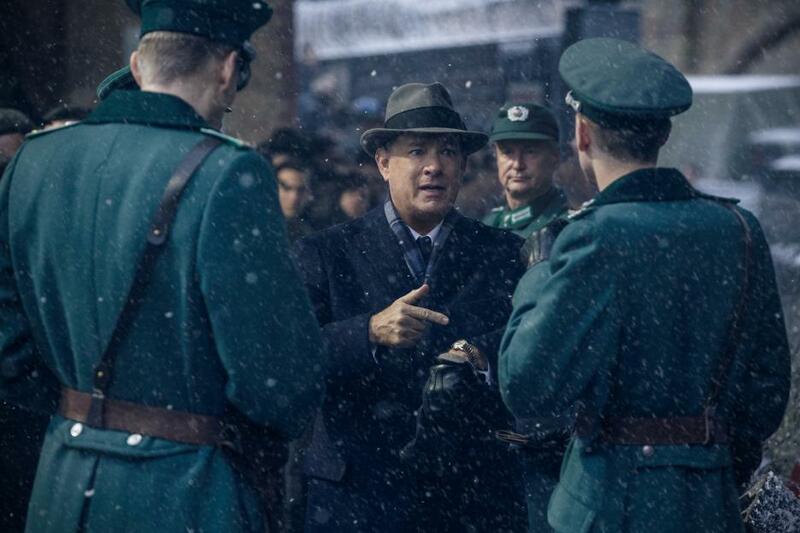 Previously, Spielberg has focused his attentions to the Holocaust, WWI, WWII and the War of the Worlds, the Cold War gets its due in Bridge of Spies. Old-fashioned and classically designed, Bridge of Spies is a without question a throwback to another time and place on terms of Hollywood cinema. 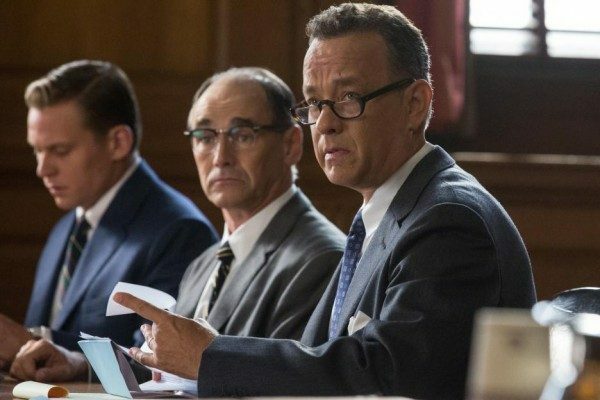 With an ace Tom Hanks in clear Atticus Finch mode as a stand-in for strong American idealism, clear-eyed ideas and well thought out connections between our gray area-soaked past and ever murky present, the film is solid, if perhaps a bit on the dull and chilly side. Spielberg masterfully imbues a delicate and pristine polish to his Cold War drama, but the movie fails to ever fully come alive and properly connect emotionally.